The 12,198 foot summit makes Mount Teide the highest point in Spain and the highest point above sea level in the islands of the Atlantic. Tenerife offers resident species year-round including bottlenose dolphins, pilot whales, sperm whales and up to 24 other species. Altitude, climate, clear skies and proximity to Ecuador, make Teide National Park a privileged place and one of the few that offer the chance to admire the night sky in its fullness. #1 zoo and #1 waterpark in the world. Tenerife is the largest of the Canary Islands and is one of the top warm-weather destinations in Europe. The spanish islands, the Canaries are located in the Eastern Atlantic Ocean. The island is filled with a remarkable variety of things to do - from stunning seascapes, black sand and golden beaches, world class resorts and hotels, UNESCO world heritage sites and Mount Teide, the islands crown jewel. 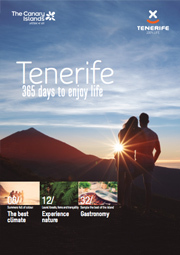 Take a trip to Tenerife- the perfect destination for adventure seekers, romance, families looking for the warm weather destination any time of the year.